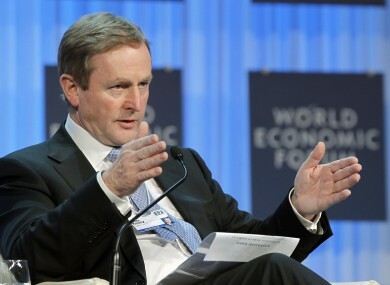 Enda Kenny’s comments at the World Economic Forum in Davos yesterday have been sharply criticised. Kenny during a session at the World Economic Forum yesterday. THE TAOISEACH ENDA Kenny has come under fire from opposition parties after he claimed that Ireland’s economic crisis was a result of people going “mad with borrowing”. Opposition parties were quick to slam the comments made by Kenny at the World Economic Forum in Davos yesterday where he was asked about Ireland’s economic problems. Fianna Fáil said the Taoiseach was “taking one approach at home and another abroad” while Sinn Féin described the mark as “offensive”. During a session which included other European leaders at the forum in Switzerland yesterday he said: “What happened in our country is that people simply went mad with borrowing. The extent of personal credit, personal wealth created on credit, was done between people, banks – a system that spawned greed to a point where this went out of control completely with a spectacular crash. Fianna Fáil TD Niall Collins said: “The Taoiseach is clearly taking one approach at home and another abroad. While he’s here, the priority is media management and preserving popularity. “When he is abroad, the priority appears to be to avoid putting the blame where it belongs. For example, where was the Taoiseach’s harsh criticism of European banks which helped flood Ireland with credit for years? He should be standing up for the Irish people and challenging the role of the banks when he has the chance. Meanwhile, Sinn Féin’s Padraig Mac Lochlainn said that Kenny’s remarks were “offensive” and said that he owed an explanation to the Irish people for the comments. “This is an appallingly ignorant synopsis of the crisis and falls into the usual clichéd response offered by those who want to protect the economic status quo – that we were all responsible, that we all went mad and that we caused the mess ourselves,” Mac Lochlainn said. “The fact of the matter is that people were aggressively cajoled into borrow large sums of money during boom times to buy homes, the prices of which had been driven through the roof because of successive government policies which encouraged property speculation. The comments are the latest in a series of gaffes by Ministers in the coalition. Last week, Finance Minister Michael Noonan was criticised for comments that emigration was a “lifestyle choice” while earlier this week Transport Minister Leo Varadkar talked of a ‘bomb going off in Dublin’ if Ireland did not meet its obligations to the now defunct Anglo Irish Bank. Email “Taoiseach slammed over 'people went mad with borrowing' comments ”. Feedback on “Taoiseach slammed over 'people went mad with borrowing' comments ”.